A decade or more ago, there were only two common and popular nails shapes: round and square. These days, nail shapes are as varied as the nail embellishments and manicure types created by masterful nail artists. Yes, nail artists, because they push boundaries and set nail art trends. Considered to be the strongest and most conservative, this shape is great for short nails and/or those that are weak and susceptible to breaking, but is also perfect for long, durable fingernails as well. That said, it works best for a wide nail bed and thicker fingers since it produces the appearance of a thinner nail and slimmer finger. One of the most common shapes, it has become synonymous with the French manicure. But, it is much more, this traditional shape makes the nails look longer. It is best for those with a large nail bed and long nail, for, in contrast, it tends to make smaller nail beds and nails looker shorter and broader. It is also a sturdier shape since it is leveled and thicker, making it less prone to tears. These are best for active people, be it busy moms or athletes. Oval shape is suitable for both wide and narrow nail beds. 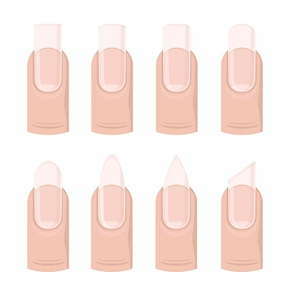 This shape not only works for a variety of nails and nail beds, it also can make the fingers look longer. However, to achieve this look, you will need thick and wide nails (be they fake or natural). If you are going with natural, however, you need to grow you nail to a standard length. Squared nails, though traditional, can come off as harsh and hard. You can soften those edges by rounding the edges of your medium to long nails, either of which can be of any nail bed shape or finger size/shape. You’ll keep the fortitude the square shape provides and, at the same time, provide the softness and elegance of the oval. This shape is best for long, strong nails since the tapered sides significantly weaken the nail’s natural strength. If you are not one with naturally strong, durable nails, you would require a fake nail treatment such as acrylic to substitute. If you don’t use your hands much every day, this look is definitely for you. Its pointy shape makes short fingers look longer and thinner, but because the nail itself is narrow, thus creating a weakness factor, it’s best for those who are not very active or who do not use their hands much, as it can make tasks a bit difficult. If you want to try out nail art, this shape might be good for you. It is exceptional for nail art, as it provides a broad nail surface, but it best for nails that are thick, long and not prone to breakage. On the plus side, it is suitable for all finger shapes and sizes. A lipstick shape looks just like you’d think: it has a semi-square shape, but one side is sharply edged and diagonal (on a bend). This pointed, arrow head look is reminiscent of the tip of an ink pen. Best for short, stubby finger, this shape elongates and slims. Of all of the shapes, round and square are best for nails that are sturdy and healthy. If you are on your way to achieving proper nail health with the help of one of our amazing technicians, or if you have “fake nails”, there is no reason to forgo your desires. If there is a look you are going for, you can get there with our nail care artists, no matter the state of your nails—all you have to do is ask. Set up an appointment today.